“We have ramped up our efforts to implement innovative strategies to leverage and commercialise home-grown technologies in order to create sustainable new enterprises and subsequently job opportunities. We realise that by developing and commercialising research and development projects within academic institutions and by creating new spinoff companies, universities can contribute to job creation and economic development,” said Prof Cheryl de la Rey, Vice-Chancellor and Principal of UP, at the launch event. TuksNovation was established with the support of the Small Enterprise Development Agency (SEDA), the Department of Small Business Development, and the Department of Trade and Industry. It has access to an extensive network of industry partnerships through its affiliation with EBIT and is currently expanding its government and industry partner networks. There are more than 3 800 postgraduate students in the EBIT faculty and services could be expanded to other science and technology-linked faculties at UP in the future. The goal is for TuksNovation to act as a catalyst for the development of industrial clusters which positively impact the Tshwane region. 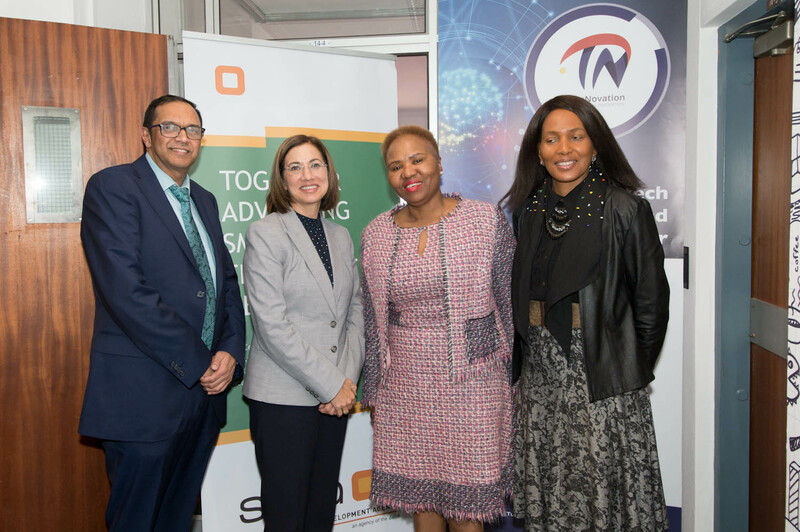 Prof Sunil Maharaj, Dean of the Faculty of Engineering, Built Environment and Information Technology, Prof Cheryl de la Rey, Minister Lindiwe Zulu and Mandisa Tshikwatamba, CEO of SEDA. TuksNovation offers world-class technology development and commercial support through the technology and business development life cycles. It provides technology development and entrepreneurship skills support up to the industrialisation (production) phase, to ensure that the technology is fully developed and addresses a relevant market need. A virtual incubation programme focuses on technology and techno-entrepreneurship skills, while an acceleration programme focuses on commercialisation and business growth. UP also prepares its students for the work place through the development of entrepreneurship skills through courses offered by Enterprises UP, as acquiring a degree does not necessarily guarantee a student a job.